Packaging: 25kg/plastic drum or 50kg/plastic drum or 200kg / steel drum. Customer design packing is available . It is an excellet agent and natural surfactant for liquid and water-soluble pesticide. Saponin can self-degradable, and non-toxic. During the separation process it will not impact the chemical property of the pesticide and lasting the effect of the pesticide. Saponin is wildly used in the herbicide (such as Glyphosate), and insecticides (such as Bisultap). Especially for Glyphosate, saponin can improve the adhesive force and wet absorption. Meanwhile enhance the penetration and biological activity of Glyphosate. It can reduce the dosage of pure herbicides to 50%-70%. It is an organic molluscicide without any potential harm to human, animals and environment. 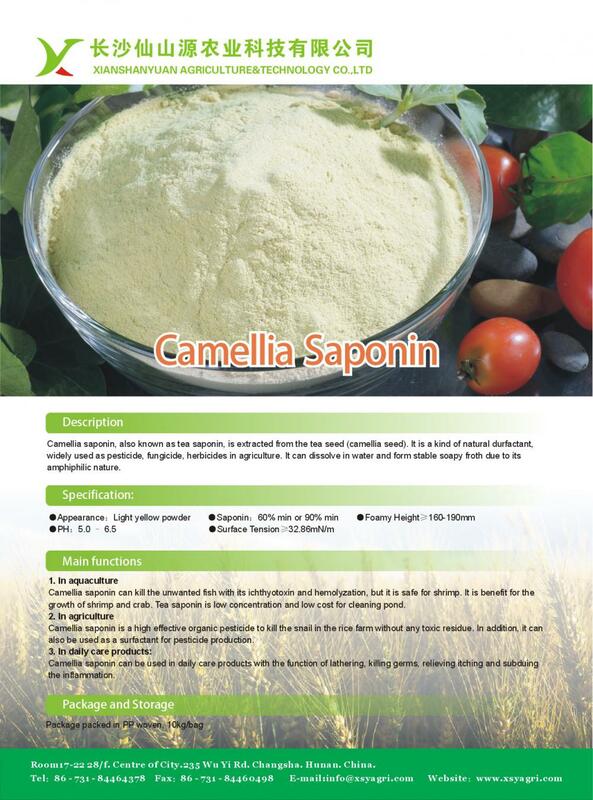 It is largely applied in rice field to kill snails, especially Golden Apple Snail with good efficacy. It also can ensure high harvest and top quality of rice without accumulated harmful elements. It is extensively used in aquaculture to eliminate unwanted fish and harmful insects in the fish and prawn ponds. Help shrimps take off shell earlier and enhance the growth of shrimps. Detoxify quickly in water and are not injurious to cattle and people who may use the water. Leave no cumulative adverse residues, and it is readily available, economical to use. It can prevent the black-gill shrimp disease and control parasites as well as improve the ecdysis and growing. It can be made for pond-cleaning agent on the account of hemolysis and fish poison functions. In livestock breeding, it can reduce the level of cholesterol inside the animals and develop low-cholesterol animal products. It is effective substitute antibiotic and can reducing the diseases for both humans and animals so as to improve the whole aquatic breeding industry and eventually bring heath. It can be used as foaming agent and foam-stabilization agent in air-added concrete production. It can be made of excellent flotation agent, significantly improve the flotation efficiency. 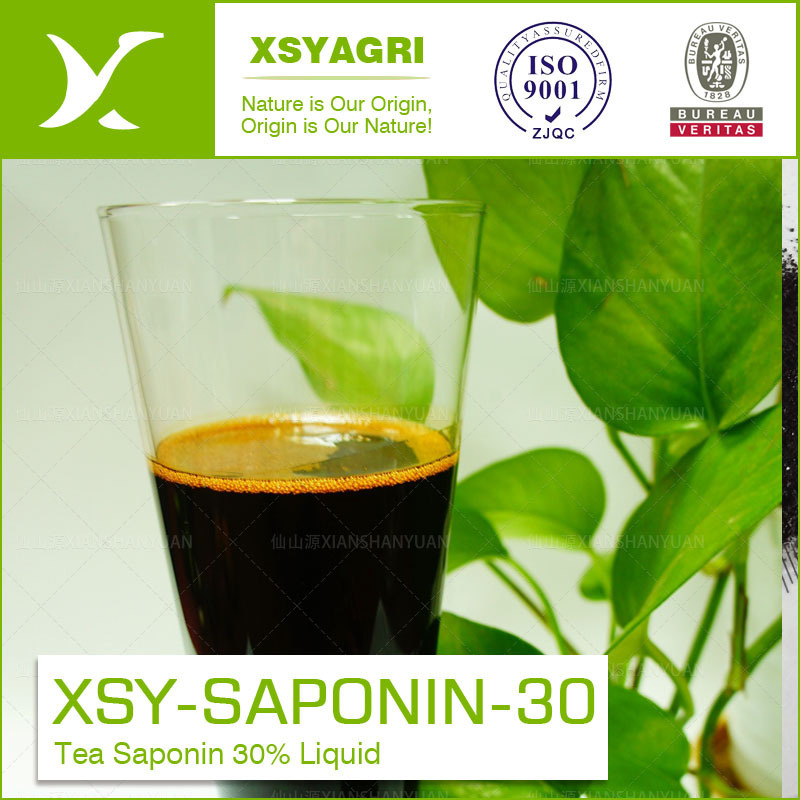 Looking for ideal Tea Seed Saponin Manufacturer & supplier ? We have a wide selection at great prices to help you get creative. All the Wet Absorption are quality guaranteed. We are China Origin Factory of Pesticide Pesticide. If you have any question, please feel free to contact us.